Parents of a six-year-old Waswanipi boy, who was taken on a medevac flight to Montreal on his own in August, described the trauma their son experienced at Quebec's inquiry into the treatment of Indigenous people. Valerie-Lynn Gull wrapped her sweater around her six-year-old son Pelle Jr., who was lying on a stretcher in an air ambulance last August, about to be air lifted from Chibougamau, Que., to Montreal, after doctors suspected he was bleeding internally. "I walked out of the airplane and I cried," said Gull, testifying on Thursday at Quebec's inquiry into government relations with Indigenous people. Moments before, Gull and her husband Pelle Loon had been told they would not be allowed to accompany Pelle Jr. on the plane, a decision Gull said her son couldn't understand. "He said, 'How come a sick kid can get on a plane without his mom and dad?'" Gull recalled. They were told by a nurse that neither of them could take the plane with their son. The family had just driven from Waswanipi, Que., 90 minutes away, after a week of tests and visits at the local clinic for flu-like symptoms. Before take-off, doctors and nurses tried to soothe him and insist he was a big boy, but Pelle continued to cry. "He said, 'No, I'm only six years old, I can't go on the plane alone. I can't do this alone'" his mother told the Viens Commission. Gull promised her son she'd meet him in Montreal as soon as she could, and the parents began the eight-hour drive toward the Ste-Justine children's hospital. As they were driving through the night, a doctor and a social worker called them to ask why they had not accompanied their son on the plane. Then, her voice echoing through the car on the speaker phone, the doctor said she suspected Pelle's bleeding was possibly due to a problem in his liver. "To hear that something is wrong with my son's liver while I'm driving is not a good feeling," Gull said. That drive is something many parents from Quebec's remote communities have experienced. In January 2018, a group of doctors wrote to the health minister, demanding that the practice of not allowing a parent to accompany their child onboard these flights be stopped. Then-Health Minister Gaétan Barrette announced in February his government would review the policy. Nine months later, one of the doctors who first highlighted the problem said he has seen improvements. Dr. Samir Shaheen-Hussain is a pediatric emergency physician and assistant professor in the faculty of medicine at McGill University. He said his colleagues estimate that 50 to 60 per cent of kids who are taken on medevac flights on the Challenger air ambulance now arrive with a parent. Those numbers have even increased in the past few weeks, Shaheen-Hussain told Quebec AM. "Compared to 100 per cent refusal rate, that's good. But compared to the rest of Canada or other countries around the world, we're nowhere near where we need to be," he said. Shaheen-Hussain has testified twice at the Viens Commission, including this week, and heard Pelle Jr's story. "It was heart-wrenching," he said. "Both those parents put into words what we've been saying for months — what people have actually been saying for years, if not decades." Shaheen-Hussain said the trauma Pelle and his family experienced on being separated is something doctors aren't privy to, but was front and centre in Gull and Loon's testimonies. Gull said once she reached the hospital, exhausted and disoriented, she was again asked by medical staff why she had not gotten on the plane with her son. Pelle Jr. would not speak to her at first. When he did, he asked her if he was going to die. "I can't imagine what was going through his mind when he got on that airplane alone," Gull said in tears. Weeks later, back home in Waswanipi, Pelle Jr. stares blankly at the wall whenever his parents mention the airplane. "I've never seen that look on his face before," she said. Pelle Jr. reacted well to treatment, but he could eventually need a liver transplant. Gull said the constant worry that the internal bleeding could start again weighs heavily on the family. "I'm constantly thinking, 'Do I have enough gas in my car, do I have enough funds to go to Montreal again," said Gull. Both parents took time off work following the incident, feeling "physically and emotionally" drained, said Loon. Gull told the Viens Commission she hoped changes would be made, "not only for my son but also for other children, so they don't have to be medevaced on an airplane alone." She said she was especially worried for children in her community who only speak Cree, and who can't communicate in French or English. Shaheen-Hussain said the emotional trauma endured by families like Pelle Jr's should be enough to convince the new government to continue working toward that goal. "There's no cost, no price tag that anyone can put on those things," he said. With files from CBC's Quebec AM. 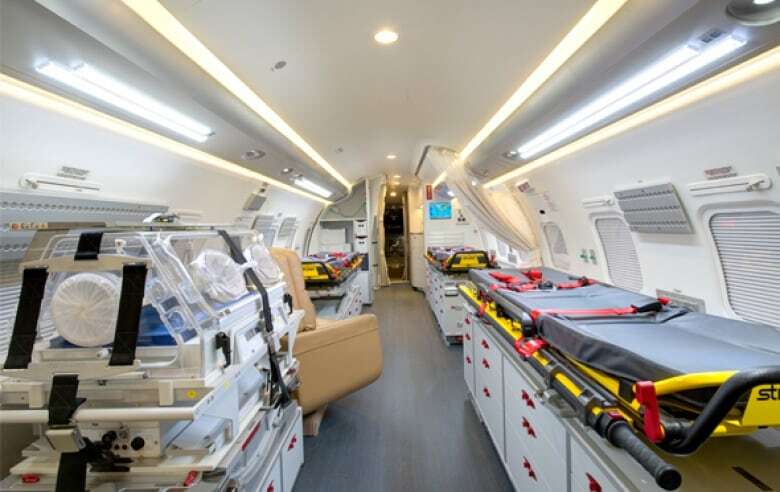 Correction: A previous version of this story incorrectly stated that "40 to 50 per cent of kids who are taken on medevac flights on the Challenger air ambulance now arrive with a parent." During his interview, Dr. Shaheen-Hussain rather said that "40 to 50 per cent have still been unaccompanied," therefore implying that 50 to 60 per cent of kids now arrive to hospital with a caregiver. An earlier version of this story reported that 40 to 50 per cent of children now travel with a parent on medevac flights. In fact, Dr. Shaheen-Hussain said "40 to 50 per cent have still been unaccompanied," meaning 50 to 60 per cent now travel with a parent.